With one full month left of a challenging year in Alberta, industries are looking at current news to predict what’s to come for 2017. As a builder, we’re connected to it all. We’re here to support the commercial, industrial, and municipal sectors of our great province. When one feels the brunt of the economy, we sympathize. Our success is tied to yours. With construction being a key facilitator of new business endeavors, we keep our eyes and ears close to industry updates. Today, we’re here to share some of the stories that may very well indicate good things to come. Keep reading. Trump Actually Good for Alberta Construction?? We know. This statement comes as a surprise to many. There was darn near national panic when Trump surprised the world to become president-elect. But now that the dust has cleared, many economic experts are taking a good look at what Trump policy may mean for Canadian industry, Alberta construction in particular. Michael Atkinson, president of the Canadian Construction Association, along with other industry experts, speculate on the potential benefits. The reason for the (guarded) optimism? Namely the fact that Trump stated that he supports construction of the Keystone XL pipeline from Alberta. For all of the justified controversy that surrounds this proposed project, there’s no denying the financial gain to the province should it move forward. There would be an immediate lift in demand for steelworkers, oil industry workers, service jobs, and construction. This increase in employment would then boost consumer confidence and inject money back into the local economy. Trump has also been vocal about a sweeping change in NAFTA. While there is some valid initial concern, economists Avery Shenfeld and Royce Mendes are quick to note that this reimagining would look more like a Canada-U.S. deal. That leaves Mexico out of the loop, making Canada more of an equal partner. If a Trump U.S. leads to more demand for Canadian product to compensate for Mexico’s drop-off, we could see more potential for economic gain. With many export commodities (agriculture, energy, etc.) born in Alberta, our province could be a prime beneficiary in a new Canada-U.S. trade agreement. The increase in demand for these commodities would boost the need for complementary industrial facilities and once again stimulate consumerism. 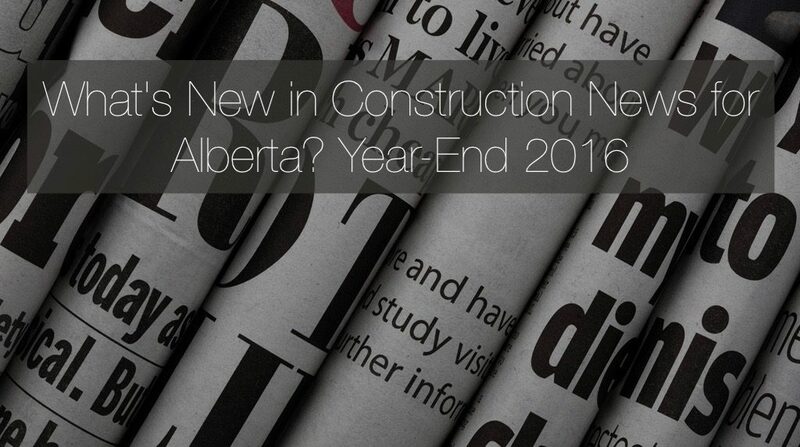 It’s all speculation at the moment, but with economics often based on exactly that, 2017 could be very bright for Alberta construction. ATB (Alberta Treasury Branches) Financial released statements in November, noting that the worst is behind the province. The economy will stabilize, then grow. According to chief economist Todd Hirsch, GDP will begin growing, by a modest 2.1 per cent in 2017, with more to come in the years to follow. This positive outlook is no smoke and mirrors to abate consumer concerns. It is backed by real data. While awaiting the energy sector’s return to form, the agriculture and forestry industries have performed in 2016 and will help lead the way in 2017. There is also a silver lining behind the lower Canadian Dollar, with tourism booming, bringing tangible money into the commercial sector. Other industries are demanding more construction in Alberta, including bio-industrial, environmental, and technology. It seems that industry diversity, along with a healthy dose of patience, will pay-off in the year/s to come. Hang in there Alberta, we’re on the way back, and Apple Building Systems is ready to help your enterprise grow. Contact us to get started on your new construction project in 2017.